Memoir of Sir James Y. Simpson, Bart., M.D., D.C.L. OXON. One of her Majesty's physicians for Scotland, professor of medicine and midwifery in the University of Edinburgh, foreign member of the Academies of medicine of France, Belgium, and New York, etc. etc. Edinburgh : Edmonston and Douglas, 1873. Description : [1 l. frontis.] pl., -xiv, [1 fl. ], -544 p., 24 p. advs. ; ill.: 1 phot. ; 24 cm. Photograph : 1 woodburytype portrait. Photographer : Elmslie William Dallas (1809-1879). Subject : Medical biographies — Sir James Young Simpson, Bart. (1811-1870). Author caption: By J. Duns, D.D., F.R.S.E., Professor of natural science, New College, Edinburgh. Pastor of the Free Church, 1844. 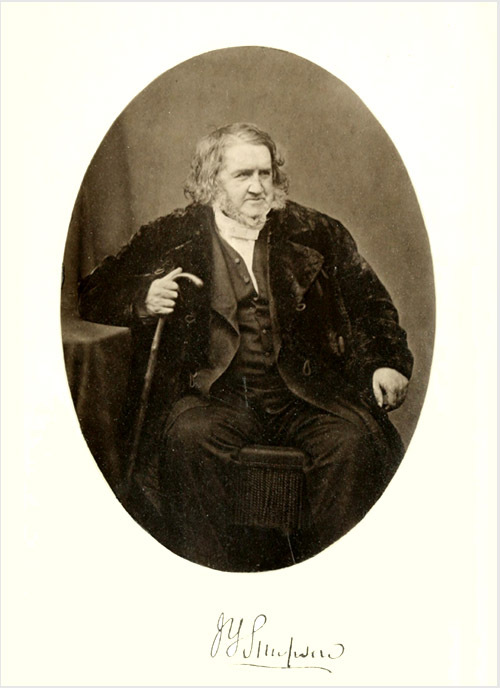 Professor of natural science, New College, Edinburgh, 1864. Elected fellow, Royal Physical Society, Edinburgh, 1864. President, Royal Physical Society, Edinburgh, 1868. Fellow, Royal Society of Antiquaries, Scotland, 1874. Vice-president, Royal Society of Antiquaries, Scotland, 1879. Photo caption: facs. of Simpson's autograph. Photo caption: Dallas Phot. Edin.